Looking for an extra ghoulish soup this Halloween? Well, look no further. I scoured the web for the scariest sounding soups that also happen to be edible. From a dead sea soup to a eyeball and bug soup and even a graveyard soup, I'm sure you'll find inspiration to make your own horrifying soupy treat this Halloween. Have a Happy, Safe, and Soup-tastic Halloween! 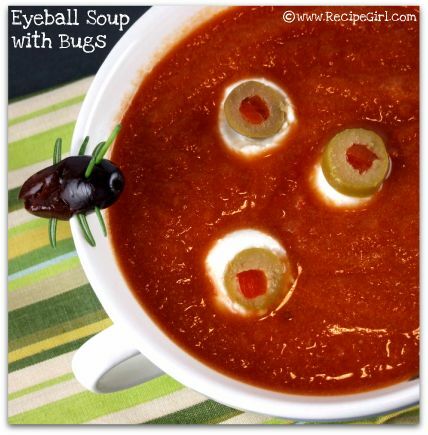 Eyeball Soup with Bugs - The perfect soup for Halloween, Recipe Girl adapted this eyeball soup with bugs from Martha Stewart Living that includes using kalamata olives, chives and fresh rosemary for the bugs and mozzarella balls and pimiento-stuffed olives for the eyeballs. As a soup itself, I love the combination of tomatoes, oregano, cream, garlic, white wine, and onions that can stand on its own as a delicious tomato soup - with or without the bugs. Teeny Tiny Graveyard Soup - This recipe by Soup Song involves some prep work and creativity to make a visual graveyard come to life via your soup bowl. The recipe starts by making a broth made of chicken legs, chicken feet, celery, carrots, and various spices, but no garlic (Soup Song says "you won't want to keep the vampires away.") The soup also calls for the creation of various body parts like hearts and blood, guts, fingers, and teeth that cleverly uses plum tomatoes, tagliatelle pasta, white asparagus, and white corn, respectively. After you make this horrifying soup, be sure to read Teeny Tiny and the Soup Bone (right below the recipe)- this one is a real hair raiser! Dead Sea Soup - Halloween is Here is all about frightful Halloween treats ranging from creepy coleslaw to brain cell salad to this dead sea soup. This recipe uses celery hearts, artichokes, chicken soup, and blue and green food coloring for the dead sea look. Try a bowl without the food coloring for a healthy Halloween treat. Moldy Cheese Soup - This recipe on Perfect Entertaining is described as a "sophisticated broccoli and cheese soup" that uses food coloring to enhance the soup's moldiness. As a broccoli soup, this recipe sounds quite indulgent that uses three types of cheese (parmesan, gorgonzola, and fontina), heavy cream, butter, and white wine! A hearty seasonal treat, indeed. What is your favorite Halloween soup? Even though I love creating my own soup recipes, there are some days when looking through cookbooks and magazines for inspiration goes a long way. Whether it’s new recipes or trying to figure out how I want to vary the classics, these books are staples in my own personal soup kitchen. Packed with 500 recipes, Suzanne Blake’s pint-size soup book by the same name is must-have book for the new and even the novice soup maker. Packed with International soups, classic recipes, broth, bisque, and chowder, the recipes are not only easy to understand but also ideas and tips as well as what ingredients can be use to vary every recipe. Its 10 chapters – sub divided into cooled and chilled; healthy and wholesome; smooth and creamy; meal in a bowl; 20-minute treats; sophisticated starters; Asian and fruity flavors – allow for almost soup to be covered from new recipes to classic. There are also stunning pictures that accompany every recipe and an informative opening chapter about how to prepare various stocks, garnishes, and suggestions for what foods can accompany soup. For a cheap find, this soup book has been on my shelf for quite awhile and I can’t imagine it not being there. Sunday seems like it was almost designed for soup. The slower pace and time is just what Sunday’s are about and Betty Rosbottom, author of Sunday Soup talks about just that. Filled with 60 soup recipes (one for each Sunday of the year), the book and its soups are devised by seasons – in the approximately titled “Soup Calendar.” Perfect for the beginner, the recipes aren’t too intricate and Rosbottom tries to keep it simple; not even insisting on homemade stock or fresh herbs – citing the value and quality of store-purchased stocks. She does, though, have soup stock recipes when you are ready to make that leap and a list of "Soup-er Sides" to accompany this comforting meal. Another staple in my household, this colorful collection of soups includes from around the world recipes and the classics in Debra Mayhew’s The Soup Bible. Stunning pictures accompany the recipes that also include simple tutorials by Mayhew on how to garnishes and stock (fish, meat, chicken and vegetable) as well as how to make stock for Japanese and Chinese cooking. Each recipe includes a brief description and simple directions that are clearly devised into the following sections: light and refreshing, one-pot soup meals, hearty lunch and supper soups and special occasion soups with interesting selections like Indian Beef and Berry Soup, Beef and Apricot Swirl, Moroccan Harira and much more! With over 200 recipes, this book doesn’t get old. The title speaks for itself, and lucky the recipes in this comprehensive book that lives up to its name. Written by Clifford Wright, food critic and award-winning author of the James Beard Award, The Best Soups in the World covers the most popular soup recipes from across the globe. Not only about recipes, the book reads as a mini-history book –describing the historical and cultural relevance behind each regional soups – including an organized list of soup recipes in appendix B where you will find them listed by their geographic location. The recipes, though, are the prize of the book. With over 250 soups, the recipes are organized into 14 chapters – ranging from basic broth to chilled soups – leaving much to choose from like the Tanzanian Black-Eyed Pea and the Georgian Beef and Apricot Soup. Most of the recipes use somewhat exotic ingredients, but thanks to the helpful information in appendix A you can find out where to locate them online. I often turn to this book for some inspiration and out-of-the box ideas and after you take a quick look through it, I’m sure you will too. Vegetable Soups from Deborah Madison's Kitchen is a must-have guide for anyone who wants to learn a thing or two or 100 about soups. Great for the beginner, the book covers the gamut of soup recipes from classic soups and their variations to original recipes, and those that are specific to a region. Written in 2006, the book specifically covers vegetarian-based soups such as how to make light broths, bean-based soups like black bean, lentil and pea, and roasted vegetable soups, along with two comprehensive appendixes that discuss how you can change certain ingredients to vary the flavor of your soup. The book is very easy to understand, that along with the gorgeous full-color pictures will get you excited to make a vegetable-based soup the next time you cook. What are your favorite soup books? A simple soup recipe, this parsnip, leek, and apple soup was also the mystery soup at the soup party last week. Packed with fiber, vitamin C, and antioxidants, this delicious and healthy fall soup is a great way to use ingredients that you likely have at home that also takes virtually no time to cook. The result was a silky and creamy soupy that is perfect for those crisp fall days. 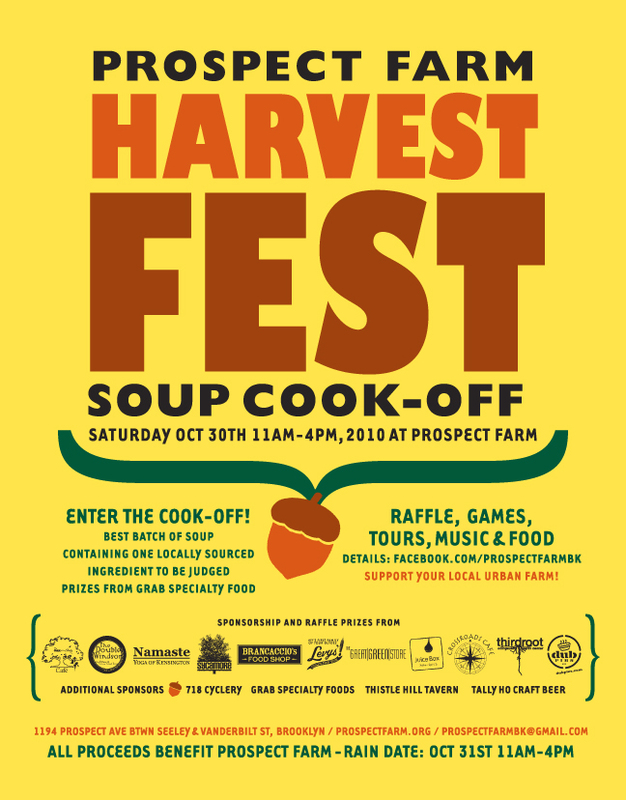 If you happen to be in Brooklyn this weekend, be sure to check out the Prospect Farm Harvest Fest for an afternoon of music, games, tours and a soup cook-off! Greetings, soup lovers of the world - and congratulations to Seriously Soupy for turning one! Guest blogging best friends Joann Pan and Amanda Boyd here ready to introduce you to a fun soup that is easy and takes under an hour to prepare and eat. We woke up Saturday morning and were craving something warm and hearty for cold, fall nights, as well as for our usually empty lunch boxes for work. We found it when we were scouring binders off of prized soup recipes—One of Each Soup. It’s one of the easiest soups you can make any day of the week when you are short on time—and only takes a short grocery list. The One of Each Soup calls for one of almost every ingredient. Once everything is collected and you’re ready to chop and measure, heat the vegetable broth (or broth of your choice) to a steady simmer. If you’re feeling apprehensive about the banana, make sure it isn’t too ripe or just use half instead. While Amanda thought the banana added a little something special to the soup, Joann thought it could have done with a little less banana. Taste as you go, and you'll find the right balance for your very own One of Each Soup. I am really excited to participate in this years Prospect Farm Harvest Festival. If you happen to be around on Saturday, here are the details for this soup-tastic event! Prospect Farm has almost completed its first season. You are invited to our Harvest Fest + Soup Cook-Off to be celebrated on October 30th (raindate October 31st) at the Prospect Farm from 11am to 4pm. Please save the date for this fun day of learning about the Prospect Farm's work, member info, games, music, food, soup cook-off judged for prizes, raffle, and more. 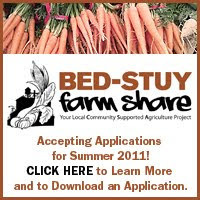 @ Prospect Farm located 1194 Prospect Ave btwn Seeley and Vanderbilt Sts. Contestants must make a soup to feed 8-12 and contain one locally sourced ingredient (within 100 miles) to be brought to the Fest and judged on the 30th of October. Soups will be made available for tasting to guests for $5. Prizes for the best 2 pots of soup include a $75 and $25 gift certificate from Grab Specialty Food and more. Judged by Foodie Brandon Maya and Chef Joesph Brancaccio. Raffle! with prizes from: Brancaccio Food Shop, Crossroads Cafe, The Double Windsor, The Great Green Store, Juice Box Wines, Oak and Iris Cafe, Levy's Unique New York Tours, Namaste Yoga of Kensington, Sycamore Bar & Flowershop,Tally Ho Craft Beer, Third Root Community Health, Thistle Tavern. and more to be announced. Volunteer for the Event: sign up to donate materials, or your time. The second favorite recipe at the soup party was this Russian beef and cabbage soup that was submitted by Rachael Mamane as an entry for the fall soup contest. Coincidentally Rachael also happens to the founder of a new locally-sourced broth company called Brooklyn Bouillon that includes a product line of beef, chicken, duck, lamb, bison, turkey, lobster and vegetable stock and veal demi-glace from farms such as Grazin' Angus and DiPaolo Turkey. So not only would I be trying a 100 percent brand new soup, I would be testing out her bouillon that is expected to hit the shelves at Eataly as well as launch later this year. I used grass-fed beef, which Rachael stated provides a richness to the soup that when paired with the cabbage and vinegar provides a natural tang - as opposed to using sauerkraut. I also used a mixed variety of heirloom tomatoes and an interesting combination of sugar, red pepper flakes and simple flavorings like salt and pepper. For this recipe, I started making the soup a day before the party and allowing it to sit overnight in its juices really enhanced the flavoring and texture of the soup causing it to easily fall apart, which Rachael also said this allows for any excess fat to make its way to the surface. Although this was the second soup voted in the taster's choice poll, it was the first one to go at the party and a recipe that is easy to make on your first try. I also found that the bouillon naturally enhanced the soup -- complementing the beef and added a rich and vibrant taste to the soup. Sadly with the franticness of making four soups over of the course of two days, I didn't manage to take a picture of the completed process, but I do have step-by-step pictures of how to make it. I hope you enjoy the hearty fall soup, and as soon as Brooklyn Bouillon is up and running you'll have a delicious stock to work with. Taster's Choice: Butternut Squash and Carrot Soup and a Soup Quiz! The people have spoken and they want Butternut Squash Soup! Note to Self: Make Better Signs for the Next Party! 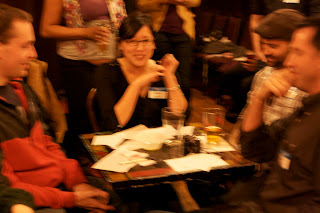 On Wednesday, I had my very first soup party at Jimmy's No. 43 to celebrate my one-year of soup making/blogging. 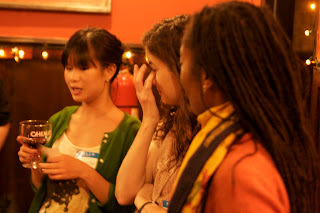 But really, I wanted start an on-going communal experience of sharing food, networking and seeing old and meeting new ones friends. For this first party, I made a ribollita (bread and white bean soup), a roasted root vegetable and turkey stew, Rachel Mamane's beef and cabbage stew, and a butternut squash and carrot soup - also now known as the Taster's Choice. There was also a mystery soup that Jessica Hulett of Blind Cavefish (followed quickly by Amy Cao of Amy Blog Chow) correctly stated was a parsnip soup - well, really a parsnip apple soup that Emily Mak of eating with emak also noted had onions. I recently had the opportunity to interview Rachael Ray about her new cooking show - Rachael Ray's Week in a Day. Premiered on the Cooking Channel, this new culinary vehicle for Ray is designed to teach people (like busy mom's) how to cook meals for the entire week in one day. So, essentially all that you have to do is re-heat your meals when you get home and make some sides. Developed by Ray and her business partner, the show focuses on a variety of meals - ranging from meat and gluten-free dishes to eclectic comfort food as well as provides strategies and tips on how to tackle the upcoming holidays. Other interesting recipes on the show include portabella-porcini cacciatore, roasted chicken with roasted garlic gravy, braised pork tacos, and crab cake mac and cheese. If making all of your meals in one week sounds daunting, Ray suggests enlisting a helper (like a child) or a girlfriend for weekly cooking parties. So, who wants to join me? Soup is essentially liquid in a pot. In order to make it something special, the right equipment can do just that. The tools of the trade listed below will help transform your soup in to liquid gold. 1. A large heavy pot. This is the most important and should not be skimped on. 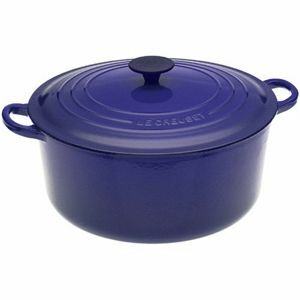 My personal favorite (in my opinion the Holy Grail of all things soupy) is from Le Creuset. 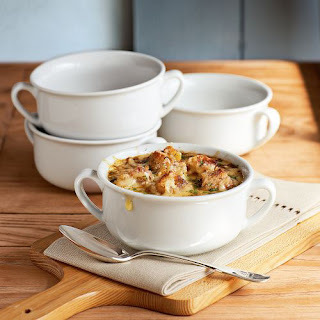 It is the quintessential soup pot due to it's remarkably even iron heat conduction and silky smooth, completely non-reactive enamel. It comes in about a million hues and while you'll pay a pretty penny for it, you will not be sorry. It's soup's "little black dress." Also on my soup pot wish list: Calphalon's Unison Nonstick 4-Quart Pot and the Cuisinart Green Gourmet Hard Anodized Eco-Friendly Nonstick 8-Quart Pot. The necessity for your creamy soups or purées. Be it a stand alone or immersion/stick variety, without this gadget your Potato and Leek soup is nothing more than runny mashed potatoes. Immersions are key to quick in-pot blends although cordless models tend to lack the oomph of the plug ins. Stand blenders are always a fail safe way to go. I recommend blending in two to three batches with a dish towel over the lid to avoid turning your kitchen into a Jackson Pollak. How can you serve soup without a soup ladle?! Of course it's possible but it's just not right (and probably way too messy!). 4. The perfect soup bowl. Tureen? Ceramic crock? Broth bowl? So many choices! So many soups! a. What kind of soup am I serving? You don't want to serve lobster bisque in your collection of over-sized coffee mugs. Just like you wouldn't serve French onion in your Great Grandmother's fine china. Be creative, but also be realistic. Your soup bowls are an extension of your soup which is an extension of YOU. Keep with your dining room or kitchen theme. Your decor speaks volumes of who you are and can really be a window into what kind of soups you will feel most comfortable experimenting with. 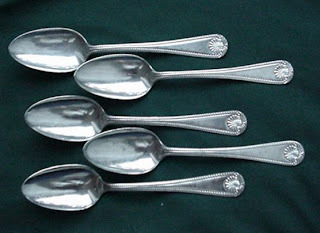 Perhaps this one is a little obvious, but no bowl of soup would be complete without a soup spoon. We love these RSVP Endurance Monty's Soup Spoons (Set of Six), the Steel Alpha Round Soup Spoons (Set of 12), and these Chinese Soup Spoons (box of 24). Joan Gioe is the mother of one amazing toddler and wife of one amazing husband. She credits him for getting her back on the writing horse. You can read her tribute to another time and place on her blog, Dear, Daughter in which she chronicles life events in the style of old fashion love letters to her 22 month old daughter. Joan's favorite soup is a good-old fashioned chicken. Soups are sometimes made for unexpected reasons. This simple minestrone not only helped me through a cold, but was also made in honor of the 2010 Making Strides Against Breast Cancer that pledges to raise awareness to "make strides toward a world of more birthdays." Since I am participating in this annual walk in Central Park this Sunday, I wanted to make a soup to honor this amazing cause as well as a recipe that reflected eating healthy. I assessed the situation in my cupboard - and realized I had almost everything for a healthy and filling minestrone soup! I started by soaking red beans for a few hours, followed by cutting up some onions, garlic and adding in some cauliflower, broccoli, zucchini, carrots and tomato sauce that made for the perfect spur of the healthy and hearty soup. What is great about this recipe is that it can be modified to use your favorite veggies or can be made even easier by using canned beans. Whatever you decide to make it, one thing is for certain: this one was delicious!Not only is it filing, minestrone soup is packed with essential nutrients and vitamins like folate, protein, and fiber from the red beans and a hearty does of vitamins A, C, and E (among others) from the green beans, broccoli, cauliflower, zucchini and carrots. This simple recipe is also economical and lasted for over a week - freeze this soup to have multiple meals later in the winter. This soups to your health! Butternut Squash, Three Ways, Happy Birthday Soupy and the Contest Winner! An extra-long post today, but I have much to talk about! First of all, Seriously Soupy is one years old! My blog, my little baby is all grown up. Ok, I'm not that weird - just very excited that I survived the first year of blogging and now have 40 soup articles and 72 soup recipes down -- (thanks, of course, to some amazing guest bloggers and writers that have contributed to the site!). Then there are those of you that actually take the time to visit Soupy: some have been around since the beginning when I was fumbling with my camera and figuring out what I was trying to say about soup (wait, that sounds like how things still are!) and a lot of you are new - coming here to enjoy our collective love of soup. No matter if you are new or old to the site, I really want to thank you for supporting me (and soup!) and thank you again and thank you some more! This year has been truly amazing and eye-opening as I've delved out of my comfort zone and tried so many new soups. As I go into this next year of Soupy, I hope to change the site with a new redesign, better pictures, visual directions, and hopefully making an appearance at some conferences. I've also been told to "lighten up" on the site and in my posts by Mr. Soupy...I'll see what I can do about that. I would also love to hear what you want to see on site - what soups, supplemental articles as well as if you have a soup that you would like to contribute as a guest blogger. Please email me at seriouslysoupy@gmail.com and so that we can develop the ultimate soup site for everyone's tastes. As I look back at some of those old recipes, it can be shocking to see some of the older pictures. Resembling something of a high school yearbook in the blogger world, I look back at some of these first year pics and cringe (see butternut squash with asparagus?!? ), but it is also comforting to know that there is progression, and as I continue learn, I will also learn how to capture the soups better. One of the first soups I made on the site was a butternut squash and carrot puree, which was also one of the only four soups I really knew how to make prior to Soupy. To celebrate this special occasion, I decided to update the recipe as a part of the one ingredient, three ways post to create the classic butternut squash, a pear leek puree topped with butternut squash fritters, and a curried carrot butternut squash soup. I hope you enjoy one or all of these recipes and continue to join me as I learn more about the fabulous world of soup. This is, after all, a work in progress and it feels great to be moving in the right direction. 2 teaspoon of nutmeg, approx. 2 teaspoons of cinnamon, approx. 1. First start with a good-looking squash like the guy above. 3. 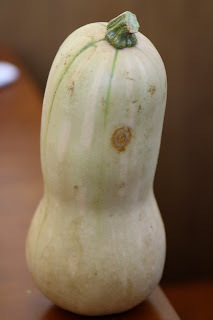 Cut squash open, lengthwise. 4. Scoop out the seeds. 3. Coat squash in garlic, olive oil, salt and pepper. Let cook for 30 minutes or until soft. 4. Boil water and cut up the onions and garlic. 5. Cut up the carrots and add the cooked squash, along with the cinnamon, cloves, nutmeg and salt and pepper to the pot. 6. Let cook for 20-30 minutes. 7. Add the cream and blend. 1. Cut up the butternut squash and scoop out the seeds. 2. Start boiling a pot of water. Cut up the carrots, onions, garlic, carrots and celery and add them, along with the butternut squash to a pot of water. Let cook on a low flame for 10 minutes or so. 3. Add the dill, curry, tumeric, cinnamon, ginger and salt and pepper and water let cook for another 30 minutes. Use your discretion - you may have to add more water. 4. Add soup to a blender. I made the soup semi-chunky, so I blended half of the mixture whole carrots and butternut squash. Top with fresh dill, sour cream, or yogurt. 1. Add olive oil to a pan. Dice the onion and cut up the leeks, pear, and squash and add them to the pan. Cover and let cook for 10 minutes. 2. Add the cloves, rosemary, salt, pepper, and water and let cook for 20 minutes, stirring periodically. 3. Turn off flame and blend into smooth. 4. Top with fritter and some pear slices. Finely cut up onion, squash and the pear. Crack open and egg and beat it. Add the cut up ingredients and the flour. Work into a ball until you have 2-3 patties. Drizzle some olive oil in a pan and add the patties. Let cook for a few minutes on each side (about 5 minutes or until golden brown) and serve with the pear and leek soup or eat alone. Before you go, I have a contest winner to announce from my very first giveaway. 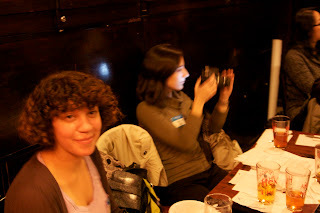 The winner is Rachael Mamane, Owner, Brooklyn Bouillon who submitted an entry for a Russian Cabbage Soup. Rachel wrote, "My favorite fall warmer is a Russian Cabbage Soup that is refined with local ingredients. When you combine the silkiness of heirloom tomatoes with the richness of grass-fed beef, you are destined for full-on comfort in a bowl. More importantly, start with a homemade beef stock and demi-glace to add depth to the entire dish, and use a combination of fresh cabbage with vinegar (instead of the traditional sauerkraut) to exact a perfectly balanced tang. The best part of this dish is that it improves with age." I will be making this soup for the fall soup taste testing party at Jimmy's No. 43 and Rachel will also be receiving a copy of " "Everyday Food - Fresh Flavor Fast ." When it is time for fish and shellfish stew and chowder I think of many places in New England and all the fabulous meals shared. I grew up in Connecticut with all the relatives in Boston and many summers on Cape Cod, so those recipes share a special place in my heart and home. “Oyster Stew” is always on the menu during the Thanksgiving, Christmas and New Years holidays for me. This tradition started for me in Goshen, Connecticut in the mid-70s. A couple friends of mine bought a 200-year-old salt-box in the Town of Goshen, Connecticut and I spent many happy holiday times with them through the years. 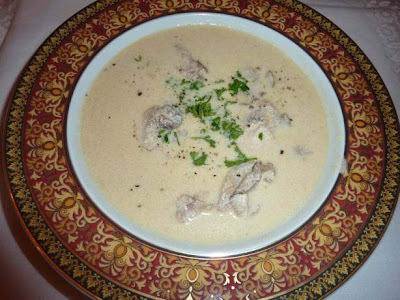 Oyster Stew was part of their tradition and immediately was adopted by me. Oh, that was easy, I love oysters! But it is also one of the first soups I make when the weather changes here in Florida. Today is the third day I have my windows open so all the soup recipes are coming out of the cupboards. 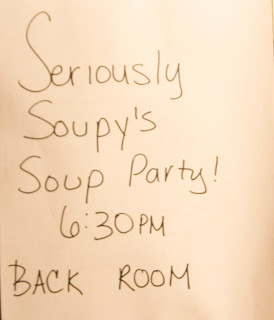 It's been a good week in the world of Soupy: I started organizing a fall soup party (being held at Jimmy's No. 43 in NYC), started a Brooklyn soup swap, and featured three soups on the site (thanks of course to the amazing Sage Butternut and Apple Soup guest post by Sanura Weathers!). This final soup of the week includes one of the quintessential vegetables of the fall: pumpkin! I didn't want to create a soup just with pumpkin (although I do love a simple pumpkin), so I added cauliflower, potatoes, yellow squash, and walnuts to create a hearty and chunky meal-like soup. I also added one of my new favorite spices - cardamom, cinnamon, ginger, nutmeg, and cloves for the ultimate fall soup. An easy one to try this weekend, along with a loaf of pumpkin bread and pumpkin latte and a pumpkin whatever else you can get your hands on. A classic soup recipe, black bean soup has always been one of my favorite comfort soups. I featured a black bean soup on the site on the early days of Soupy (or the earlier days), but I recently went to a Mexican-themed pot luck and thought that this type of soup would be perfect for the party. Plus, I really wanted to update the recipe and vary it a bit from how I originally made it as well as update the picture (major learning stages in those days). For this recipe, I added an U.C.P - unidentified chili pepper that a farmer from my farmers market passed on to me, some sweet potatoes, cinnamon, cayenne pepper, and lime. I also roasted the corn, red peppers, and carrots to create a sweet/semi-spicy fall soup. I hope you enjoy this one - it was very easy and can be varied using whatever fall vegetables you like. It can also be topped with avocados, corn, red peppers, sour cream, or cheese. Enjoy!